My first strawberry-picking experience and it was a blast! Learning about health benefits of strawberry. Endless rows of strawberry plants. Such vibrant colors...can't find these in the supermarket! Our ride to the strawberry field. Pick-Pick-Pick or more like Eat-Pick-Eat! These are not quite ready for picking yet. My favorite memory of this experience - I looked back to find my mom and our guide strolling along. Here, the strawberry field and nature are the stars. We humans are merely companions. I start out this post a little differently than others because when I was editing these photos, the colors, the imagery, and the backgrounds were so mesmerizing that I thought I should let them do the talking first! Strawberry-picking has been on my bucket list...yes, my list includes simple pleasures like this one because sometimes, just sometimes, we find the biggest joy in doing small, simple things. As I was going down the row, I couldn't stop saying "wow, look at how bright the color is!" or "look how big this one is!". And, of course, the best part is that we get to eat as much as we want to while we are picking. I probably ate a box full of these juicy creations! Don't worry, Tanaka Farms is an organic farm and it's very safe to eat the fruits and vegetables straight off the plants. What's even better is that my bestie later made some delicious chocolate-covered strawberries for all of us...see picture below for her yummy creations. Where are some of the local farms you've visited? I would love to hear about them! Tanaka Farms is a family-owned and family-run organic farm located in the heart of Irvine, California. It's a small oasis amidst the hustle and bustle of this rapidly-growing Orange County city. The Tanaka family history traced back to Farmer Tanaka's great-grandfather who immigrated to the U.S. from Hiroshima-ken, Japan and eventually relocated to California with Farmer Tanaka's grandfather. Today, the farm is a working farm and is owned and operated by Farmer Tanaka, his wife, Shirley and his son, Kenny. Together with their team, they produce fruits and vegetables that supply their produce stand and their own Community Supported Agriculture program where they donate produce to local organizations that help feed families in need. The farm has been practicing "responsible farming methods" since 1998. You can read more about it on Tanaka Farms' website, but essentially, they use organic growing methods whenever possible and use OMRI approved pesticides permitted under most organic licenses. 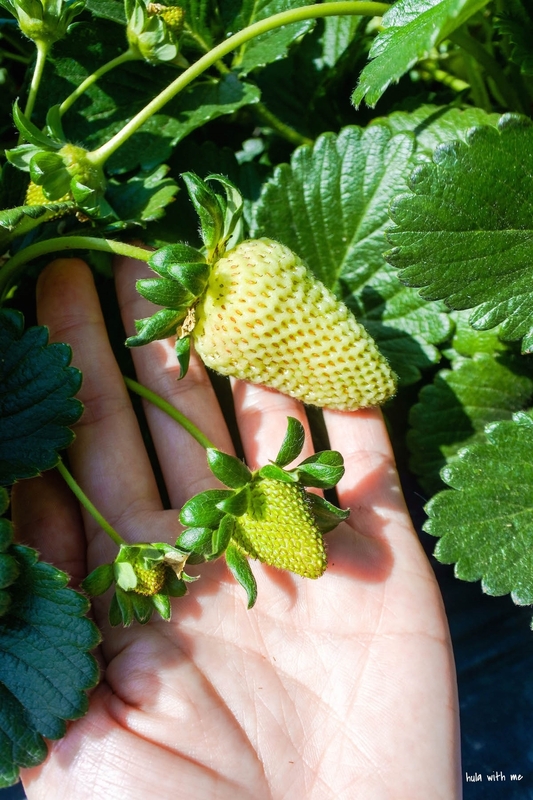 Different picking tours are available depending on the seasonal crop variety - Strawberry in March - June, Watermelon in July - August, "Harvest" in March - August (many other crops are grown at the farm), Pumpkin Patch in October, and Christmas Trees in December. I definitely felt and enjoyed the family atmosphere when I was there. Everyone who works there is very friendly and genuinely wants you to have a great time. Our guide helped us filled our boxes when he realized that we couldn't fill them all the way to the top. Just an example of how well they treat everyone who comes through their gate. Entrance to the farm and golf club. Tanaka Farms is located at 5380-3/4 University Drive, Irvine, California. It's adjacent to University of California, Irvine (UCI). Depending on the direction you're coming from, you can get there by taking 405 and 73. The Farm shares the entrance with Strawberry Farms Golf Club - In fact, as you turn into Strawberry Farm Road, you'll see the sign for the golf club. I have been "eyeing" these puffles from Cauldron Ice Cream on Instagram for a long long time. I may have planned this visit to see my best friend in Orange County, CA just for this. Haha, just kidding. I love my bestie and her kids! Flavors of the Month for March include some pretty unique options - Earl Grey Lavender, Milk and Cereal, S'Mores, Vietnamese Coffee. Yum! Cauldron uses liquid nitrogen to prepare each ice cream order, so you know your ice cream is fresh. Sorry Baskin Robbins, I no longer want frozen stiff ice cream that's been sitting in the freezer for who knows how long. We are very ambitious and each order our own puffle. We probably could have ordered two and shared, but who wants to share when your ice cream can actually be called "cute"! We opt for Earl Grey Lavender, Vietnamese Coffee and Speckled Vanilla. EGL tastes just like lavender and it's not very sweet. It's a bit strange as I'm more used to "smelling" lavender. Nevertheless, it's a very good flavor. VC has a very strong coffee flavor as the name suggests. I love how they garnish with a little chocolate "cigar". SV is more my cup of tea - Simple yet flavorful. Because the ice cream is prepared with liquid nitrogen, the flavors are much more intense and it's ultra smooth and comes in this velvety, creamy texture. As for the puffle, it is based on a childhood favorite of mine growing up in Hong Kong called the egg waffle. Its Cantonese nickname is "little eggs" (鷄蛋仔) and it is THE most popular street food among the Hong-Konger's. It's a must-eat for me every time I go home! The original way of making "little egg" is using a sweet, egg-rich batter cooked in a sizzling hot special two-sided pan with little round cells that gives it its signature mini puff's. See a story here by That Food Cray to see how it's made. The "little egg" puffle takes my mom down memory lane and the liquid-nitrogen ice cream keeps my bestie happy. And I am just excited that I get to finally try this yummy goodness. We are all in a happy place. Getting Here Cauldron Ice Cream is located at 1421 W.MacArthur Blvd, Suite F, Santa Ana, CA. It is part of a strip-mall type of shopping center, next to an urgent care medical clinic. If you see the 7-Eleven, then you have gone too far. Have you tried Cauldron or something similar? Do share with us! Life is somewhat back to normal after a few hectic weeks of packing and moving. Looking at my recent Instagram posts...I think I've been just a tiny bit obsessed with snacks and the view from our new home. Can you blame me? Especially those irresistible sweets! Hope you're having a great weekend! And Happy Spring! !